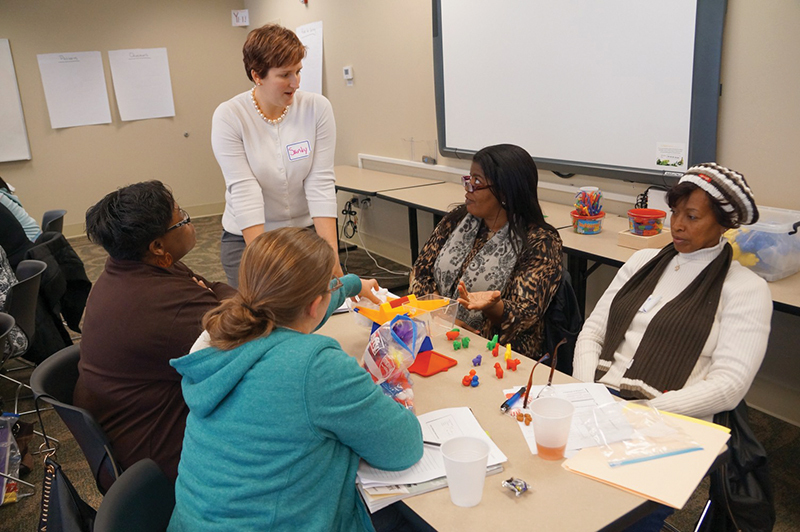 Professor Sandra Linder (standing) is helping lead the program to provide childcare teachers and home-based caregivers with skills that support mathematics learning among young children. Support for developing math skills, simulation software for automotive engineering and a state-of-the-art digital press may not seem to have a lot in common. But all three of these will be pivotal in educating Clemson students for the future. And they’re all the results of gifts from corporations and foundations that are valuable partners with the University. The PNC Foundation and the Eugene T. Moore School of Education agree that it’s never too early to develop math skills. The PNC Foundation has awarded Project BEEMS (Building Environments for Early Mathematics Success) a $50,000 grant to support the program that supports mathematics learning among young children across the state and nation. The first year of Project BEEMS, also funded by the PNC Foundation, took place in 12 Head Start centers and showed very positive results. Forming an early mathematical understanding can be particularly helpful in establishing problem-solving and communication skills, according to Sandra Linder, project director and associate professor of early childhood mathematics education. When graphic communications and packaging science students return to campus this fall, they’ll find an HP Indigo 5000 Digital Press in place and ready to use, thanks to a gift valued at $505,825 from Hewlett Packard. More than 600 students, many of whom will receive industry certification, will have hands-on experience using the press each year. As growth opportunities in the digital print market shift from commercial printing to packaging, the need for talent also shifts. Clemson is uniquely positioned to work closely with HP Indigo to develop a pipeline of capable talent and meet the needs of industry. Having hands-on experience using the HP Indigo gives Clemson students invaluable access to a growing market segment through internship and career opportunities. Professor Srikanth Pila demonstrates to his graduate students how the Moldex software further enhances research in his lab at CU-ICAR. 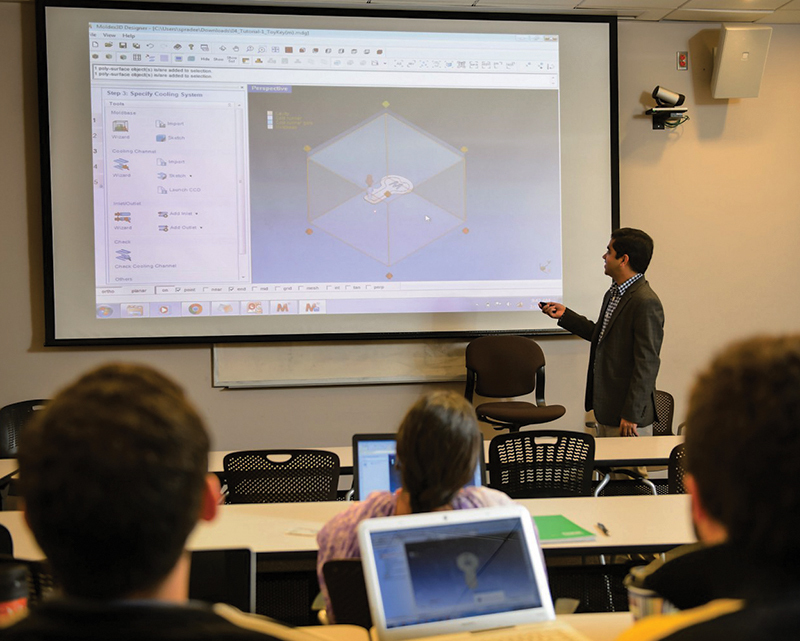 A $1.625 million gift from Moldex3D to the Clemson University International Center for Automotive Research will both provide students with valuable hands-on-experience in computer-aided engineering (CAE) software and advance faculty research, particularly in the area of injection molding. Anthony Yang, president of Moldex3D Northern America, said it is their responsibility to assist the academic world in nurturing the next generation by offering its state-of-the-art simulation technologies and resources. “As the world’s largest independent CAE software developer, we are truly pleased for the opportunity to partner with Clemson University, which has one of the most elite automotive engineering programs in the world, to help students gain more practical hands-on CAE experiences and further equip them with a viable simulation ability to compete in the future job market,” he said. All three of these gifts are part of the Will to Lead for Clemson capital campaign.